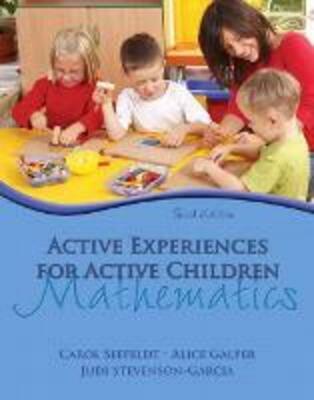 Intended for use in childcare, preschool, Head Start, and with children in kindergarten and early primary grades, the latest in the Active Experiences series is based on the most recent, nationally recognized research regarding children's approaches to learning as well as current NCTM curriculum guidelines for mathematics. The content is clear and concise, with practically applied chapters on ways to guide children's mathematical thinking and learning. Key topics involve group work, investigations, and projects; are grounded in children's interests and needs; and, build, one upon the other to form a coherent learning curriculum. Additionally, each reflects the most recent standards of the National Council of Teachers of Mathematics (NCTM) and the National Association for the Education of Young Children (NAEYC). This edition has been thoroughly revised to include updated Home-School Connection features that illustrate various ways to support children's daily learning of mathematics; more developmentally appropriate and intentional assessment guidance than ever before; research-based guides explaining children's cognitive and skill development in all math content areas, based on the Learning Trajectories Approach; and a new technology resource found at the end of every chapter.